The Subaru Ironman 70.3 World Championships 2014. Up the last hill toward the finish line. No wonder I am smiling! 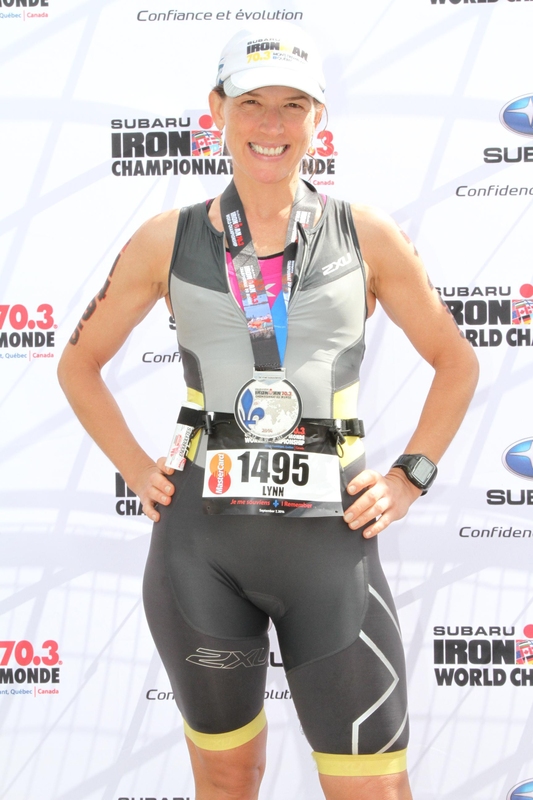 Well, there has been a delay in my writing this report – mainly because the Ironman 70.3 World Championships 2014 was not my best performance. I must however, keep things in perspective. 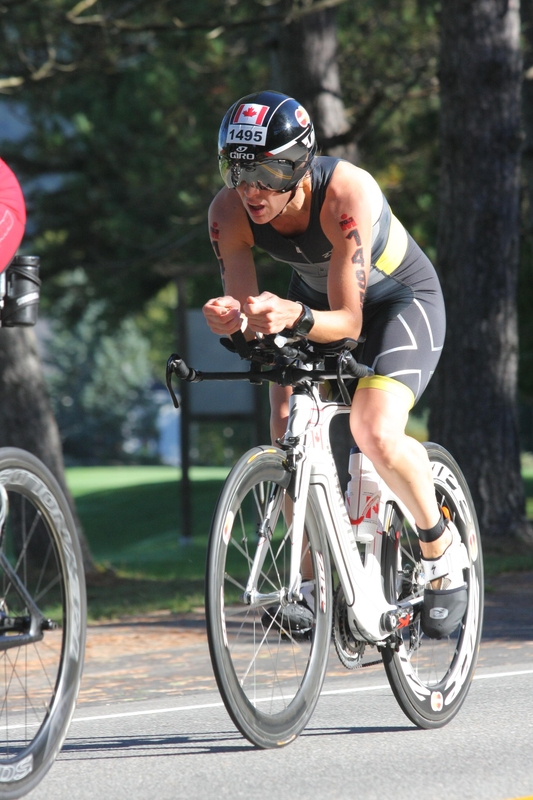 It was only two seasons ago that I got back into the sport of triathlon after taking quite a bit of time off. After only ever competing one Half Ironman 70.3 distance race back in 2000, qualifying for the World Championships in this long distance endurance event on only my third try at the distance since getting back into the sport, is a great feat all on its own. Finishing at the top of the last quarter of my category at 88/115 was not what I was shooting for at the 70.3 Half Ironman World Championships. My planned time, which I felt ready ready for, should have placed me somewhere around the 50th percentile. The competition was steep, but I don’t believe this was the root cause of my not so stellar race. As with anything that does not go as one had planned, there is an immediate feeling of defeat followed by an emotional roller coaster of resentment, anger, sadness, depression, etc. I know one thing for sure as I reflect on my “big day”, I had put too much pressure on myself to accomplish my goal at the World Championships and as such I lost grasp and focus of the big picture. Essentially, I simply tried too hard! Anyway, in short the swim is the first leg of any triathlon. At this event, the swim wave start times were in my opinion set up too close together. My wave (Women 40-44) was fourth, which was a bit of a problem considering only three minutes behind us were Men 35-59, followed by Men 19-24 another three minutes behind this group – leaving only six minutes between all 500 swimmers which evidently ending up colliding and literally swimming over top of one another in order to get form point A to point B. Not a happy camper right now! GET ME TO MY BIKE! Needless to say, I had a hard time during the first part of my race getting swum over and swatted by just my own group of 115 swimmers not to mention by the two groups of men each that followed my group. My goggles got knocked off in the first 100 metres. Panicking when the men came upon me, I spent a short time hanging on to a designated kayaker. It was crazy out there and I was only about 600 metres out. Following the lead of a lone swimmer from my group, I swam off course on the inside of the markers only going around to two red markers in order to safely complete my swim. I am not the fastest swimmer, but I am not the slowest either. When I raced this exact swim course in mid-June, I had no problems and held strong with the middle pack of swimmers. This time around, I was most definitely at the tail end of my group. I later learned we were allowed to swim inside of the yellow buoys making sure to go around the red markers at the far end in the case of a safety issue which I certainly had. This was not clear to me before the race even though I did bring the wave order issue up to the race director by email two weeks beforehand. All said and done, I ended up swimming an extra 160 metres, according to my Garmin GPS device. I did not know this as I had the device set to show time only on the swim screen, so when I exited the water not only did I physically feel defeated – when I looked down at my watch I lost my mental focus immediately. If I hadn’t have worn my Garmin at all, I would known where I stood. Because of the swim panic, my had begun to act up, so I used my Ventolin in the first transition (T1). This was my second dose of the day as I had taken a preventative dose pre-race. 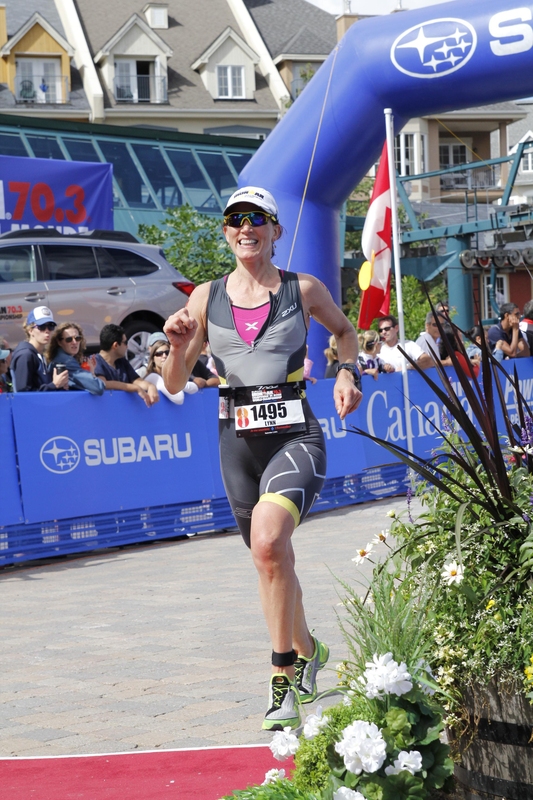 My asthma had begun to bother me earlier in the week when the sudden little late summer heat wave began about 6 days prior to the event, and it had gotten progressively worse upon my arrival at Mont Tremblant on the Thursday before the race. Out on to the bike course, I started to feel myself again – as if I had a competitive chance to have a good race. Until the huge packs of men came charging along riding in full on peltons. 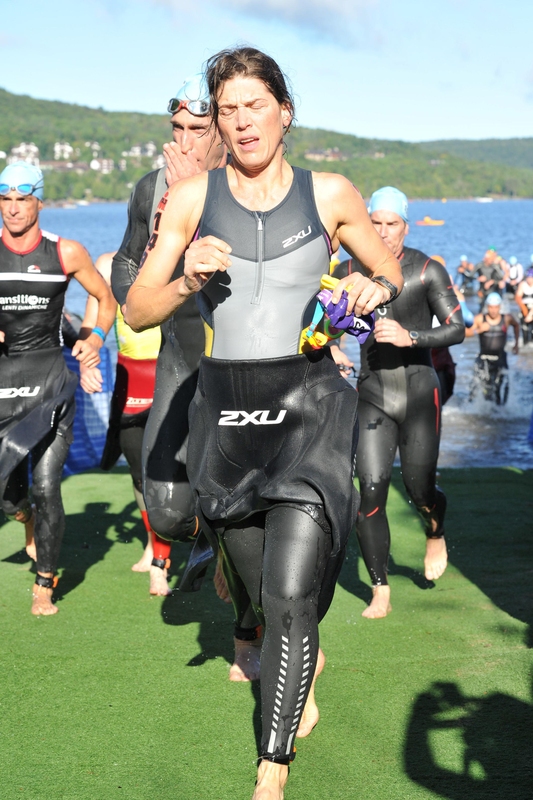 Drafting and all – which is not permitted on the Ironman circuit! It is dangerous due to our aerodynamic handle bars for the most part. In the Olympics, the triathletes ride very similar to bicycle racers in large groups, but if you take a look at their bikes, they do not have the long aerodynamic handle bars us long distance folks do on their bikes – and for good reason. If there is a crash, the longer bars could really hurt someone. Anyway, I got caught in one of these large groups and had to take it upon myself and my good biking skills to brake the group up. I was feeling very unsafe, especially when the only other girl caught in the group had tried to exit unsuccessfully. She veered out into an oncoming group and then subsequently veered back into our group. When she did this, our group became unstable. We were travelling close to 45 km per hour at times. So, what I did was gear up and pull out at a safer time – getting out of the saddle as I charged to the front (and then some) – “chicking” all of the many sorry men in the group. Well, let me tell you this group dispersed like a flock of birds at the sound of a hunter’s gun! Onward and upward as they say. I was now in a safer and legal position on the bike, but I probably dusted my legs from having the best possible bike I could have by getting myself here. I had to use my Ventolin again (for the third time) as we head back into the hills of Mont Tremblant during the last 15km of the bike leg, and again the feeling of mental defeat poured upon me. I decided I’d go a little easier on these hills so as not to “ruin” my run. Poor decision looking back in hindsight, more for mental reasons. If I had of kept striving to do my best no matter what, I may have had a better ending to my race. Hindsight is 20/20, you know. Heading out on to the run course, I felt alright the first little bit. I held back the first couple of kilometres, but the hills hit me anyway. Basically about half a kilometre in, the climbing begins and does not end until you reach about 5 km. Then you kind of come back down but then have to go up once again directly through the ski village on even even steeper terrain. Several many athletes threw up during this stretch of the race. 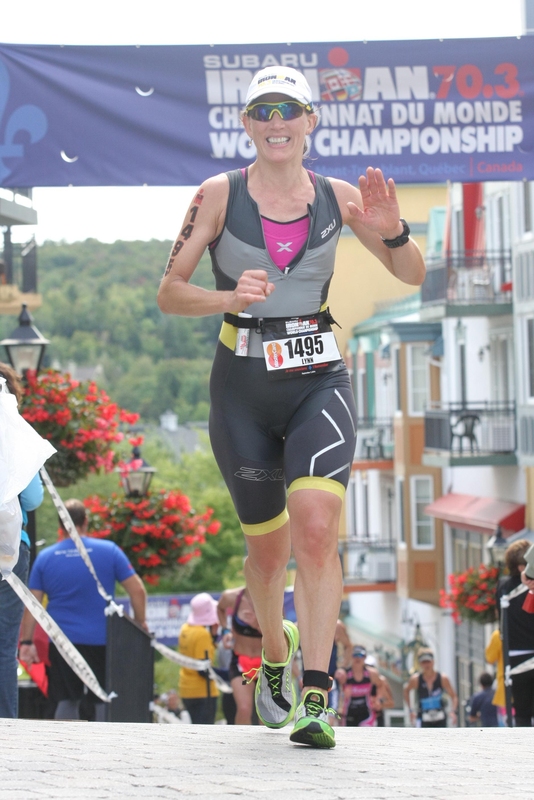 Normally, the 70.3 Mont Tremblant does not do two loops of this hilly mess, but for the World Championships, the decision was made to take out the “flat trail” at the back end and keep this world class event challenging and hilly. Yes. Challenging it was. Let’s just say the first loop was a complete struggle. I did not want to use any more Ventolin. But, I resorted to using THREE more doses the second loop out of sheer desperation to just get her done! Either my asthma was genuinely put off with the warm front/seasonal allergies, or my rib cage was off put with my scoliosis OR my lower iron may have been causing the breathing issues. Regardless of what made this such a trying day for me, making it to the finish line in one piece with my happy face on was by far one of the most challenging things I have done in a long time. Not my best race. Period. But I am ready to learn from my mistakes and beat ‘er down next season! Showing off those shiny whites! I may have missed the boat on some of these this season. Done and done and done! Thank you MasterCard, 2XU, Heath the 11th and La Bicicletta, Genuine Health, Steve and his team at Du Tri and Run, Eon D’Ornellas – who is always there at the most important races with superbulous last minute quick fixes, and all of my colleagues at Totum Life Science who helped me through a tough season.